CONGRATULATIONS TO THE ORIGINAL CAST OF STRAYS! Special thanks to Theatricks Advisory Council, Theatricks/SCP Administrative Director Webster Crocker and the SCP Board. Premiered November 6-7-8, 2014 at the Honey McGee Playhouse, Sherman, Texas under the direction of Frank Steele and Amy Shojai. Licensed and produced April 28-30, 2016 by Hartman Middle School, Houston, Texas under the direction of Robert Powell. 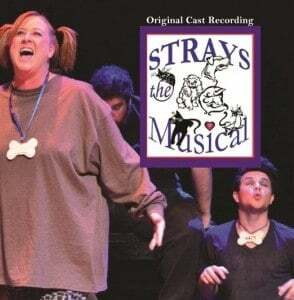 STRAYS, THE MUSICAL explores furry foibles from the PETS’ point of view. The actors give voice to a variety of cat and dog characters in this hilarious–and often moving–musical review “drama-dy” that seeks to edu-tain audiences about normal pet behavior while honoring the bond we share with them. Playwrights Amy Shojai and Frank Steele are both passionate pet advocates. 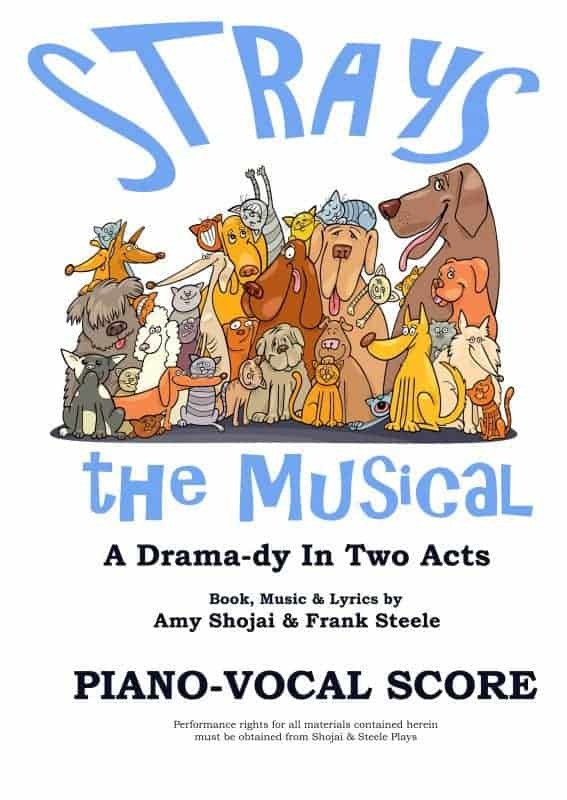 STRAYS, THE MUSICAL is written especially with pet lovers in mind. 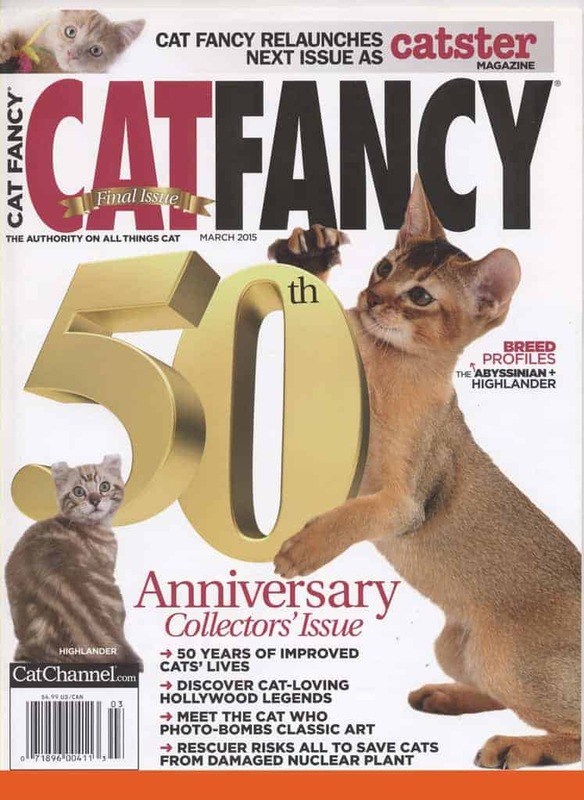 The review-format show runs approximately two hours in a mix of funny to poignant scenes (with and without music) and is designed to be modular–that is, it can be licensed for performance using only the cat-specific, dog-specific or general (both) content that best suits the audience. The authors hope it will be widely used in pet-specific fund-raising efforts. CAST RECORDING of the original performance now available! Get the script with vocals here, and the piano-vocal Score and the cast recording here. Licensing the play for performance grants the producers access to 15 discounted (non-returnable) scripts, as well as (returnable) orchestrated rehearsal/performance CD and piano/vocal score, and marketing materials/support. In addition, (optional) video projection CD with files, cast recording, and DVD of original production are available. Please indicate requested performance date(s), venue/# seating, proposed ticket price, and audience (public/private). For licensing and/or perusal contact SHOJAI-STEELE-PLAYS @ shojai.com (no spaces) with STRAYS in the subject line. 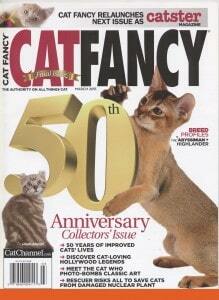 Thank you to CAT FANCY MAGAZINE for this paw-some press! Scroll down for a short video sample from our Opening Night. 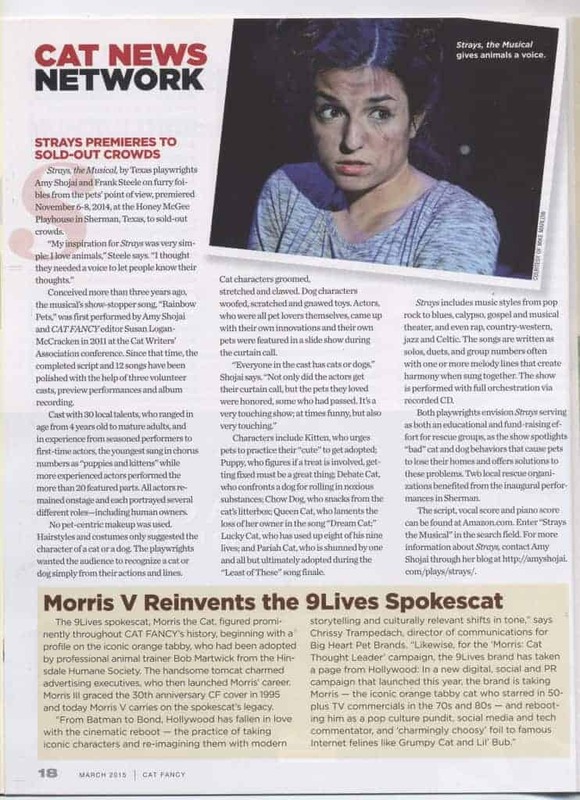 Scroll down for an EXCERPT from the opening night performance of STRAYS (filmed by Mike Marlow) on November 6, 2014. 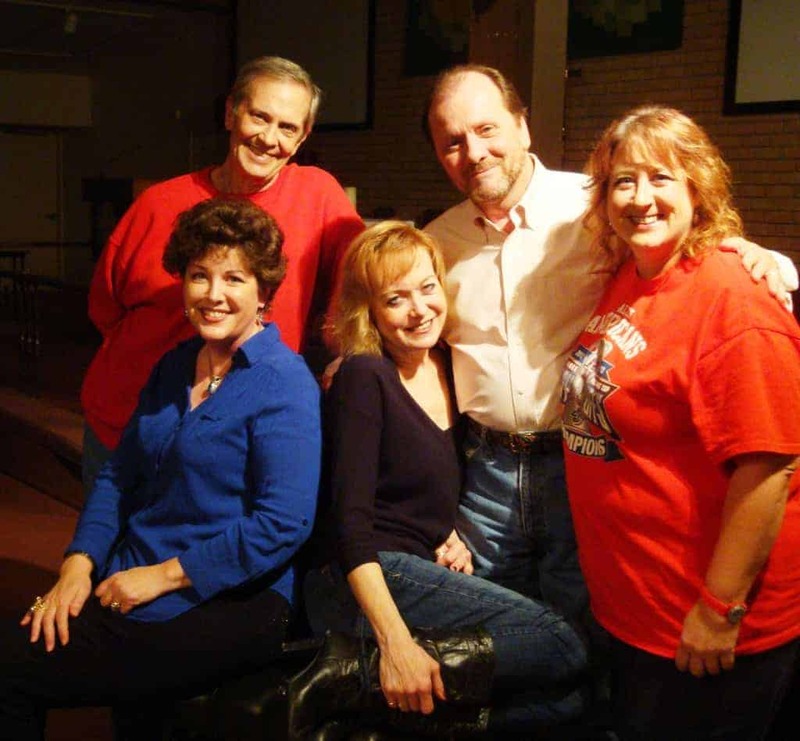 STAGED READING was held MARCH 22 7:00 Honey McGee Playhouse, Sherman, TX. Strays: The Musical truly is a Broadway-worthy production, and I say this as a long-time New Yawker with many dozens of Broadway show ticket stubs among my souvenirs. Let’s face it: when you’re gaga about animals, that passion sometimes can cloud your judgment. Pam Hamer leads her Dillingham Middle School on April 10, 2014 spring concert choir singing NORMAL from the Strays show…the students nailed the rap–and educated the audience about pet behavior problems and solutions! "What a charming, lovely and touching show! Clearly a labor of passion. I wish you great success with this!"